From the top deck of the bus fields of gently waving wheat lap at even gentler hills for miles through the Wiltshire countryside. It's all very pleasant, and then suddenly all very strange, as though some kind of invisible border crossed, as soon as you see the first of the mammoth stones of Avebury loom up near the bus stop at the Red Lion pub. Dropped off into a photo-friendly English village that's dominated by giant standing stones at every turn, it's not like stepping into another world, but more like stepping between worlds, a historical crossroads of folklore, nostalgia and the sense of a deeper, more ancient and never quite settled history shaded with pagan rituals and forgotten rites. Avebury's megalithic stone circle is 500 years older and 15 times bigger than Stonehenge, so big that it really can contain a small but whole village. 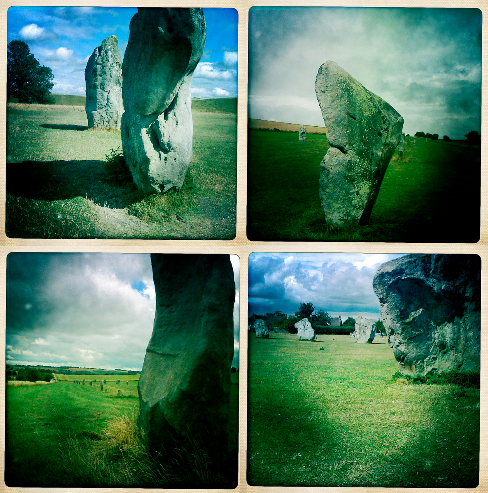 Built over five centuries from around 2500 BC, it's one of the biggest prehistoric stone circles in Europe and a World Heritage site, but there's no restrictions on wandering around the stones, touching them or, as happens, dancing around them on pagan feast days. The circle of stones is the visible centre of a serpent design of megalithic sites in the area that together may been a temple. The West Kennet avenue of stones connects the stone circle to the former timber circle of The Sanctuary a mile south-east, with the manmade mound of Silbury Hill a half-mile west and the neolithic West Kennet Barrow burial chamber a further half-mile south of the Avenue. You can drive right through Avebury and see all the megalithic and neolithic sites from a car, but taking the pilgrim route (Avebury is at one end of the centuries-old Ridgeway path that runs from Tring in Hertfordshire) or at least walking around seems like the only way to feel anchored in the place . Originally there would have been more than 150 stones. Most were destroyed or buried several centuries ago (religion, agriculture and development all playing their part), but in the 1930s marmalade millionaire Alexander Keiller bought up Avebury, funding and leading the restoration, excavation and re-erection of at least some of the stones before ill-health forced him to sell the area to the National Trust. The Alexander Keiller Museum in the village features in John Betjeman's Shell Guide to Avebury film, made in the 1950s. In keeping with Betjeman's talent for picking up on the usually unnoticed aspects of our surroundings he speaks at the end of the film of Avebury's "sinister atmosphere", sparking the flipside of the Avebury mythology. Here lies not just the cute model-like village surrounded by huggable building block stones, but the Avebury of haunted inns, ghostly sightings and stones that move at midnight, a folklore knowledge made into teatime terror in the eerie 1977 children's TV drama, Children Of The Stones. Children Of The Stones is now the textbook hauntological slab of TV nostalgia. Science and the paranormal do battle in the form of a physics genius father (Gareth Thomas) and his apparently psychometric son, who together must find a way to beat the time-messing, population-brainwashing forces of a preternatural and possibly alien evil, and escape from the clutches of Iain Cuthbertson and the village (here called Milbury). Since this is 70s British TV, this means there's plenty of declaiming from the grown ups, Children Of The Damned-type acting from the children, a lot of fancy electronic equipment, discussion about science and the supernatural and an unsettling soundtrack that provided the aural touchstone for hauntological sounds later on, not least those of Ghostbox. bell, book and candle: to like or to loathe? "the hope of eternal life"
where should you eat near rosslyn chapel?